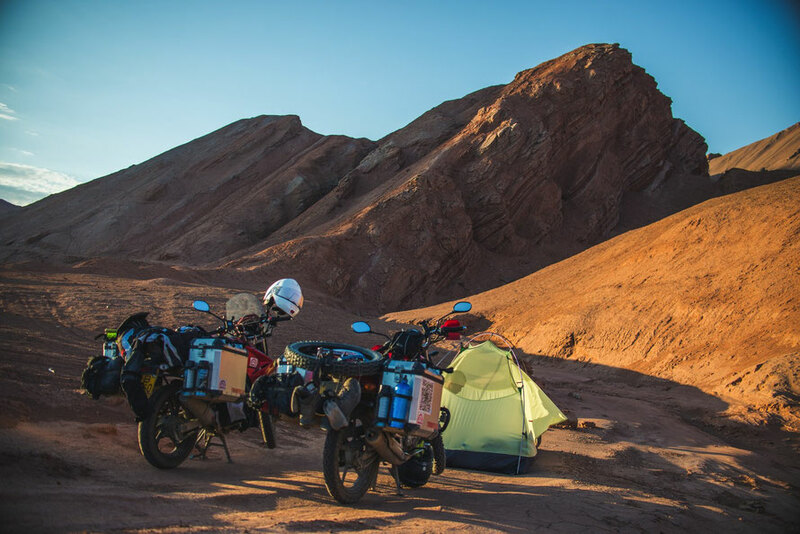 On the morning of our fourth day in the desert, we wake up in a dried riverbed at the base of vermillion mountains outside Turpan. It’s not where we planned to be; we squint through tired eyes at sunrise as we try to get out before it’s so hot we can’t drive. The night before, we had already decided to camp. Cruising towards dark at dusk we looked for spots that would make sense: something that had cover from the wind and sun, but not something stuck in between the orchards and the vineyards of the local farmers. When we saw an exit for somewhere called “big canyon,” we knew it was it meant to be. We got off the freeway on to a road that winds through a picturesque Uyghur village flush with grape vines and poplar trees. In the summer, everyone sleeps outside, covered only by a blanket and the stars in bedframes that sit out in front of the doorframes of mud-brick houses that are more walled courtyards than they are full structures. Beds begin to slowly fill up as we drive by and some people have even put a mat in the back of their three-wheeled electric moto-trucks that are ubiquitous in this part of the country. It feels like every night is a community sleep over. 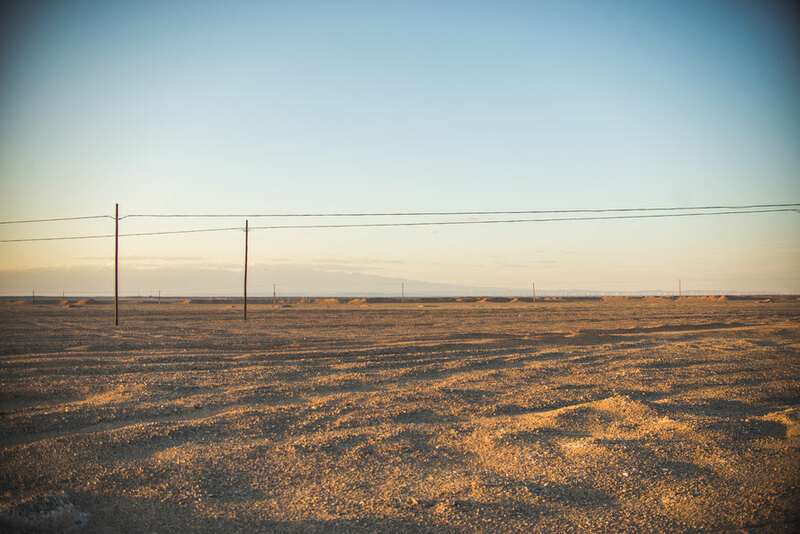 In the corridor from Lanzhou that wraps north of the mountains is where the desert begins. Slipping out of the tight canyons that divide Qinghai and Gansu, its here that we start a five-day jaunt through a khaki-red expanse. Flanked by the mountains on our left and an indefinite flatness to our right, we ride in high winds that almost push us off our bikes and through places with ominous names like “An Xi Especially Barren Ecological Protection Zone.” Barren earth stretches to the horizon, divided only by groaning hills scorched in black and brown. The lone presence of man is are multiple hundreds of acres of wind turbines, the pieces of which are constantly being shipped across the freeway next to us, curved and lying massive on oversized trucks like beached whales. Qilian is a place close to my heart. In the fall of 2013, Brendan, two friends and I went hiking here for a week. It not only changed my ideas about China, hiking here, and outdoor travel in general, but it also left me thinking back to its incomparable scenery and amazing people every time I thought about travelling to China. To give you an idea of the entirety of the place, I’m posting pictures here from both this trip and the 2013 trip. 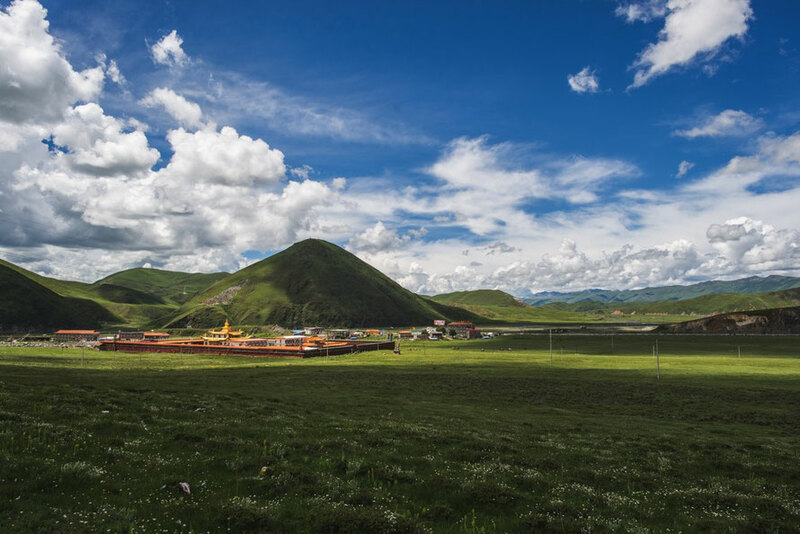 Qilian is a small boomtown next to an immense mountain range with the same name in a valley corridor of gorgeous grasslands, evergreen alpine forests and riverbeds of birch trees. In the summer almost everything is green, dotted with wildflowers and canola flowers in bloom. In fall, the entire region turns yellow. Flanked by red rock cliffs and backed by looming snow mountains it’s one of the most picturesque parts of China I’ve been to; being pretty out of the way, and somewhat off the radar (completely off the radar to most non-Chinese) it’s also extremely quiet. It’s a wonderland for hiking and unbeatable for being in nature. 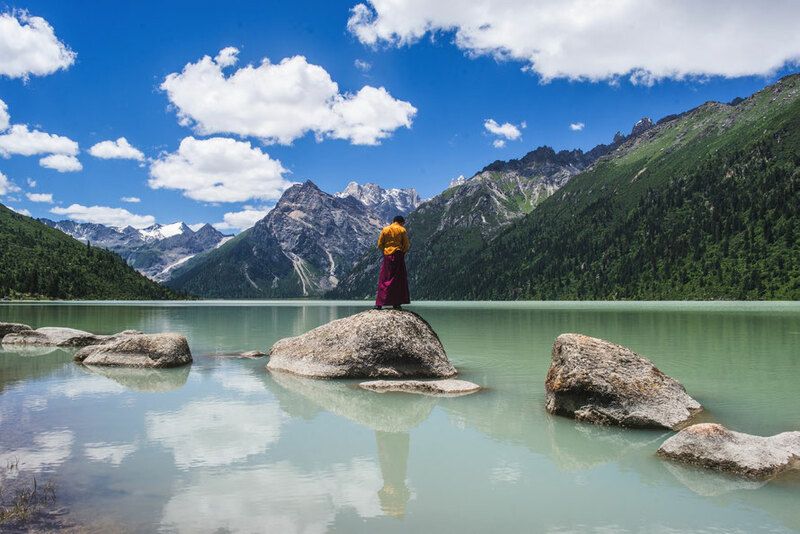 The Tibetan landscape is primordial, temperamental and unforgiving. Riding out here is glorious, but it also makes you acutely aware of your own mortality. The sheer height at which we exist everyday not only squeezes our bodies and slows our lungs but also causes the weather on the plateau to move at an alarming pace. A quick turn in a valley and it could be pouring rain, another ten minutes and it’s sunny again. The only looming indication of what is to come are the long black tentacles of rain clouds crawling over the ridges. It’s the spontaneity of the tropics coupled with the malice of the mountains. On the grasslands you are fully and utterly exposed, an insignificant addition to the landscape at the whim of changing winds. Days are bright and nights are cold; when the sun is out you hate it and when it’s gone you miss it. In two weeks we experience every possible iteration of the elements: sun, rain, snow, fog, lighting, landslides, hail. We pass over so many mountain passes above 14,500ft (4400m) that they all mix together. It’s this very race against the landscape, a revelry in defiance, and a slow, tacit submission to the fate that nature has sentenced you that makes driving into this landscape so exhilarating. Teetering through the valley of Manigango at dusk, our arrival to out to Yilhun Lah Tso is heralded by the soft orange glow from the mountain in front of us reflecting the setting sun. Up until now, we haven’t gotten many opportunities to camp, but we’ve headed here having been told it is the best place to do it. The air is dry and cold as we finally make it to the gate into the lake. Jie can barely walk, having slipped out his bike in the deep mud from a landslide on the road over (more on that in the next post), so I set out on my own in the twilight to find Brendan and Lucas who have taken a car here from Seda. When find them, it takes us three tries to get the bikes up the hill, a steep chute of beaten wet grass. In the dark the lake seems ominous, there’s seemingly no one around as I sift through low-lying branches and webs of prayer flags. I find Brendan and Lucas by yelling out into the night in a game of marco polo on the plateau. They’ve put up their tent right next to the waterside, the best seats in an amphitheatre of gargantuan snow mountains. We set up camp and make dinner, finally getting a chance to use all the gear we’ve prepared. More importantly, finally getting a chance to sleep on a bed of grass and a blanket of stars punched deep in the sky. 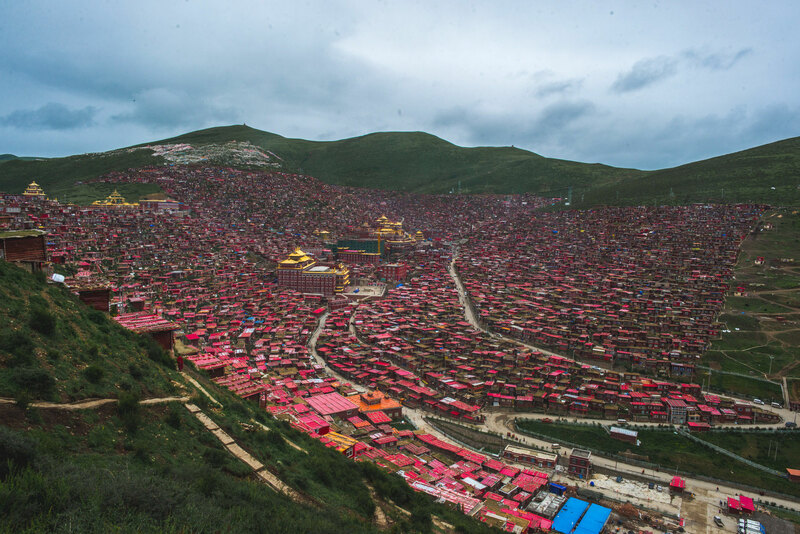 Larung Gar is the world’s largest Buddhist institute but the road there is terrible. 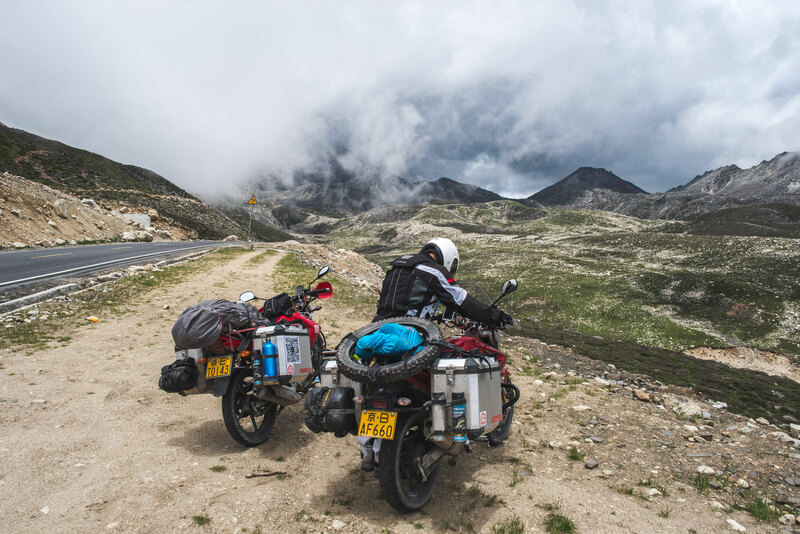 It takes two days to go the distance, we should go in one –150 km off the main road, drudging through landslides and ripped up roads from the construction that follows the edges of endless mountains. In through these undulating green giants, you would never be able to tell that tucked away at 4000m (13,100ft) are more than 40,000 monks and nuns. In fact, literally sitting at its gate we can’t tell if we have the right place. The corner store selling prayer beads and monks robes next to crackers and lollipops should be a give away, but the run-down non-descript western Sichuanese town —the main road now sort of a mud river from the rain— just doesn’t really seem right. After eating a full sleeve of cookies as brunch while watching minibus after minibus of monks go through the gates we deicide to go in. There is no real way to describe the way you drive into Sertar. Having seen pictures before, I knew it was overwhelming, but I didn’t know what it meant to be overwhelmed in it. Rows on rows of red wooden houses seem to topple down from the mountains in front of you, pulled in alleys that only get tighter the deeper you go. An architectural crimson tide pouring down and filling the basin, merging into multiples of main temples that surround the main square. It is by all means magnificent, unique in scale, scope and shape. You are literally engulfed by it. The horse festival is the biggest event of the year in Tagong. It's a multi-day spectacle of equestrian skill. The festival attracts people from all over the region and almost every family from Tagong sets up a tent on the ridge in town where the races are held. It’s celebration of community, culture, and summer. 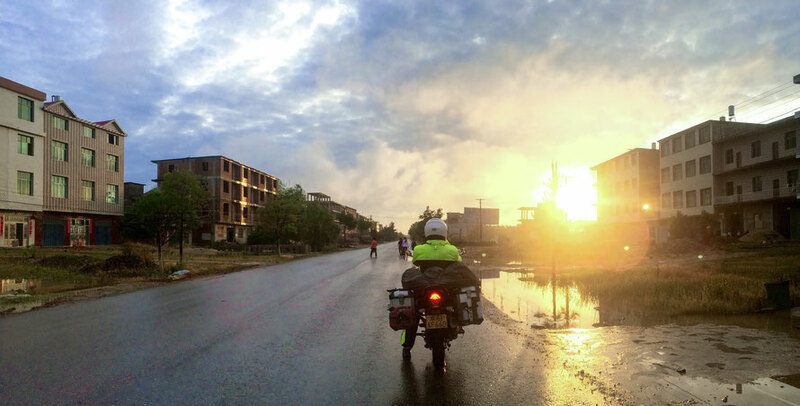 We were lucky enough to be in Tagong this year when it happened (July 2nd). The horse plays a big role in Tibetan culture, and horses can be seen everywhere: on the grasslands, in stables in town, and even roaming the streets freely. 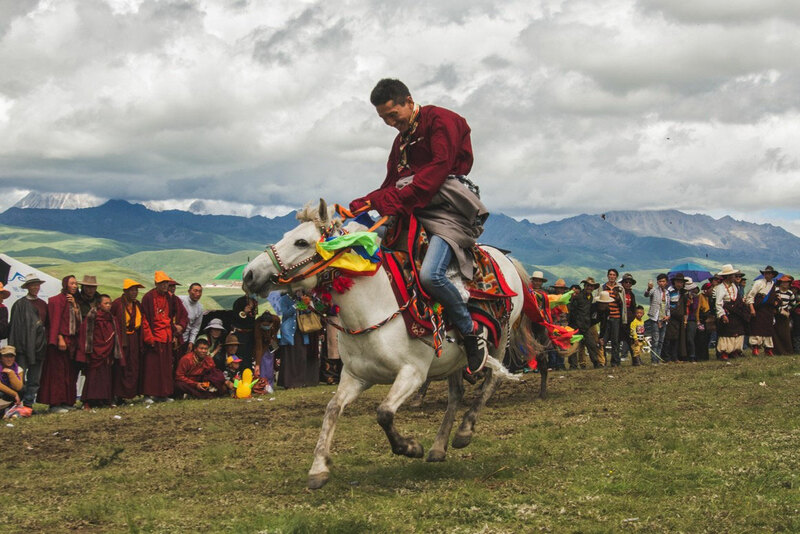 Horse festivals happen all around different locations in Tibet throughout the summer (although many have been shut down or disallowed by the government recently) and include races, skill challenges, dancing and a coming together of the all parts of Tibetan society. It's like an American state fair in terms of the ambiance --except with less corndogs-- and on par with the Kentucky derby in terms of fashion --with equal amounts of crazy hats. Onlookers dressed in their best and riders of all ages gather on the mountaintop around mid-morning as monks from the community at-large come in to bless the horses before they ride. Not all the riders own the horses they’re on, many of them are borrowed for the day from a cousin or a friend –grandfathers riding their grandsons horse and the other way around. It’s a festival less about competition and more about community. 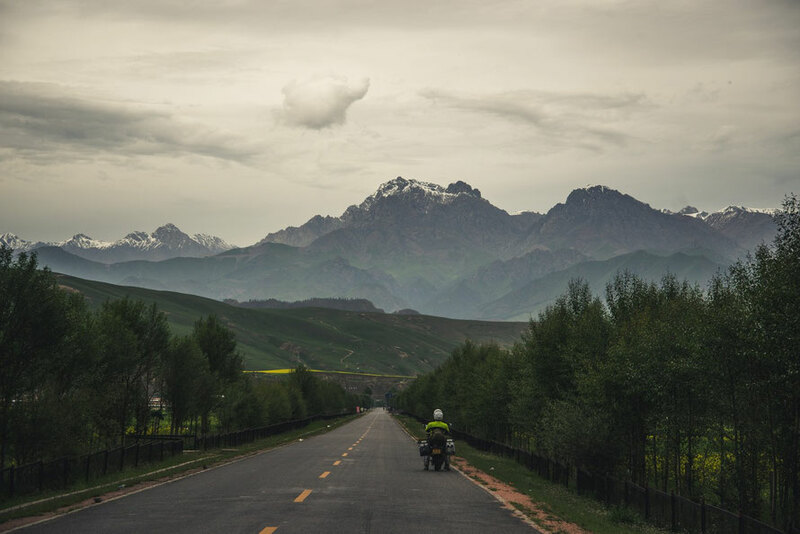 Ascending on the Tibetan plateau towards Tagong, everything we’ve seen of China changes. There are two ways to get the one-road town in the grasslands, and we choose the higher of the two, pushing from 4000 to 4400 meters (14,400 ft) --up as far as we’ve ever been. This high up the whole world is compacted: the clouds, sharper and more defined than I’ve ever seen, loom close and comforting to the earth. Towering over innumerable rounded green mountains the air slips thin but fresh in our lungs; the bikes pump with ambition flying through the highlands. In only half an hour of driving here I can see why the people here find this land so holy. It’s overwhelming beautiful –it feels so close to god. We float past ever-nearing ranges of Snow Mountains, and dip down curves in the grasslands dotted with nomad tents, some black and pressed to the earth, others white and more raised. Bathed in the afternoon sun, I feel so alive. 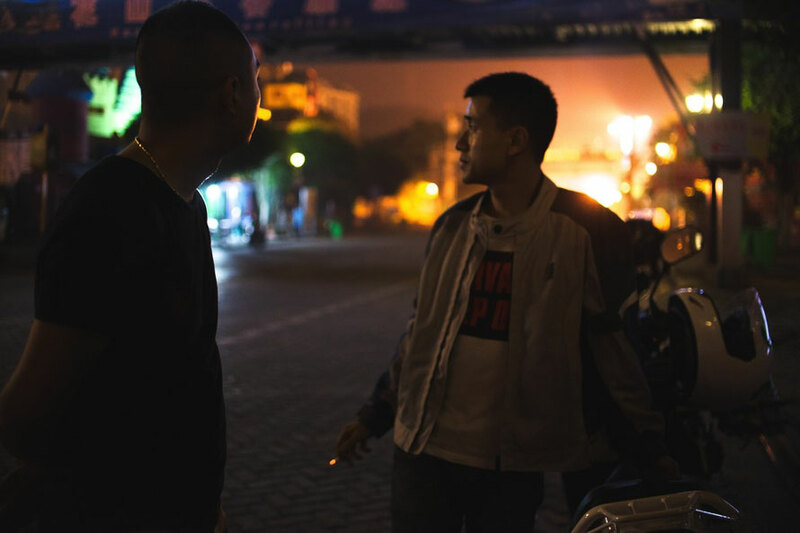 For many young Chinese, the G318 Highway has become a rite of passage. 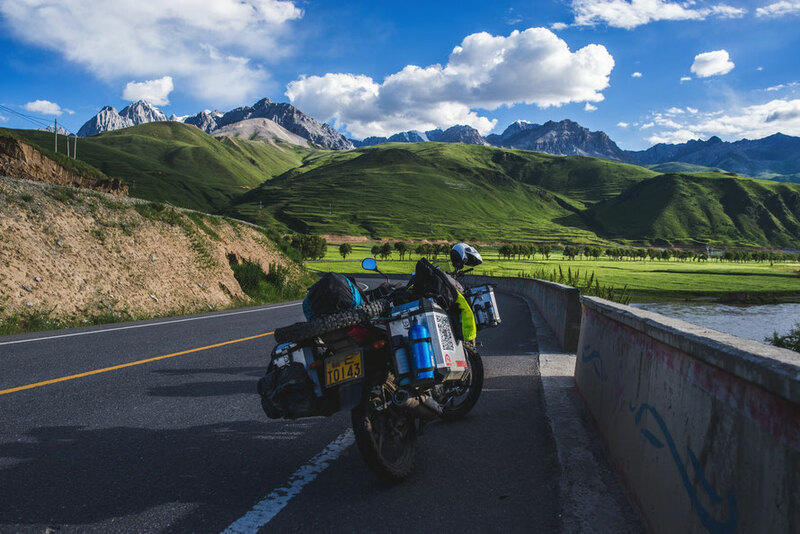 The road spans almost the entirety of the country, but has become famous in recent years for the amount of people that follow it as a guide to ride, drive, or even walk to it’s terminus in Lhasa. 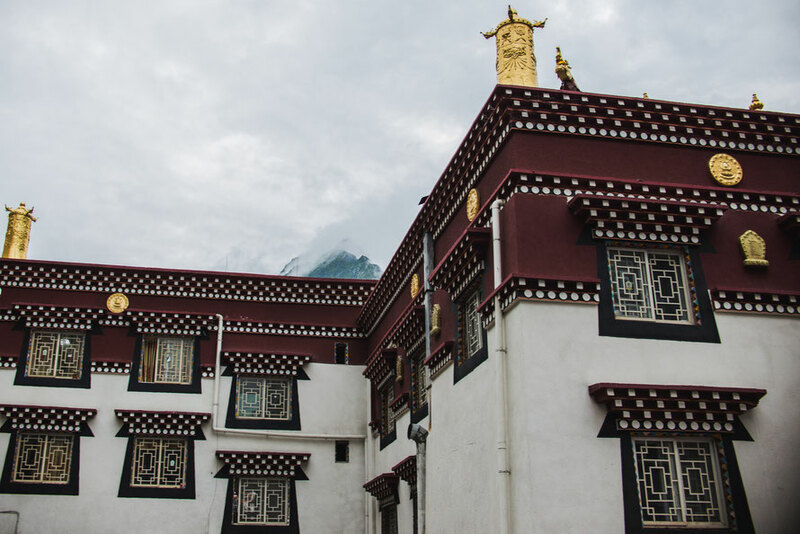 Chinese travel to Tibet has increased dramatically in the last ten years, especially with the completion of the Beijing-Tibet railway in 2006 . But the 318 is something different, something to prove. 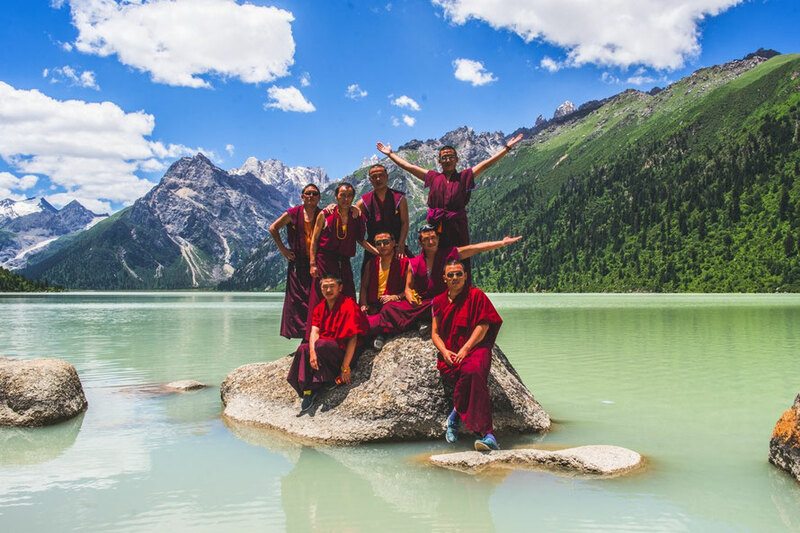 Every day hundreds set off on the 2144km trek (with more than 4500 meters in elevation change) from Chengdu to Lhasa –a place as mysterious, romantic, and different for Han Chinese as it is to the West. The 318 is now a well-trod pilgrimage, done not by the devout who prostrate up the unforgiving Himalayas, but rather by the youth of China in search of a challenge and fulfillment that life in the modern, urban PRC doesn’t seem offer –or perhaps in search of recognition from a society asking them what they have to offer. Our path was partially informed by a route suggested by the blog Land of Snows, and partially by suggestions from Chinese motorcyclists. 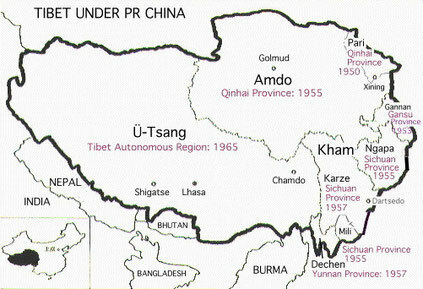 We are currently in greater Tibet, in the Chinese province of Sichuan (as you can see on the "where are we" section of this page). 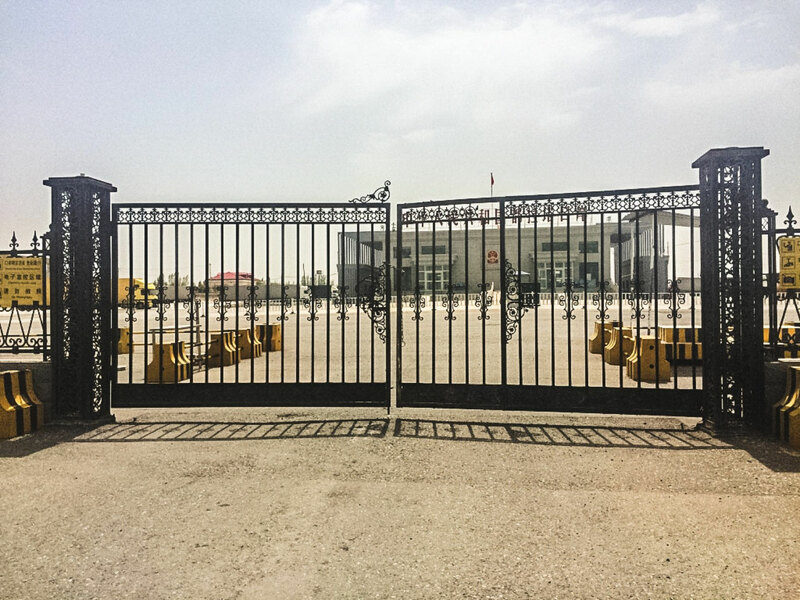 Because of political reasons and on edge relations between the CCP and Tibetans, we have been told that all internet connection is blocked until Yushu (EDIT: which ended up taking 15 days). There's lots to show and write for you all, but it will have to wait to be published til we're on the other side. Until then! The point where Chongqing turns from a county into city is not noticeable initially; the only hint is the amount of cars on the roads. Suddenly, just like the mountains, it all begins to lurch up. We arrive in late afternoon traffic, tumbling slowly into the sprawl that envelopes the banks where Yangtze and Jialing rivers meet, where skyscrapers jut up like a mouth of glass teeth on the hills. 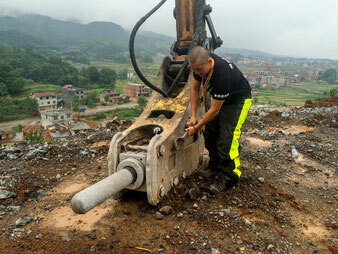 A major hub for sending things downstream, Chongqing city has boomed by design under China’s westward development program. 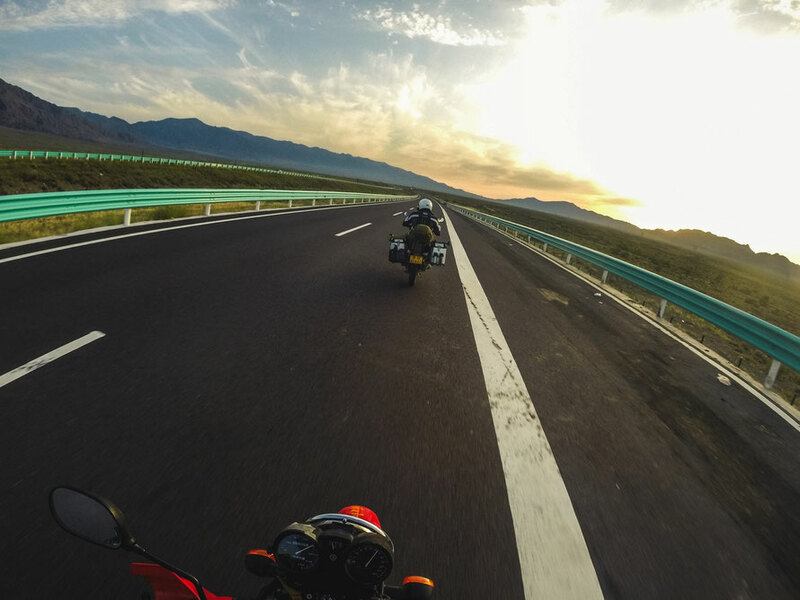 We’ve heard that this is the motorcycle capital of China, home to the factories of almost all domestic motorcycle producers. Almost more importantly, the city is all built on hills, so steep that bicycles —who reign supreme elsewhere in China— are rendered useless against a motorized engine. Entering Chongqing, a 32m people city-municipality split off from Sichuan province in 1997, the earth opens up. 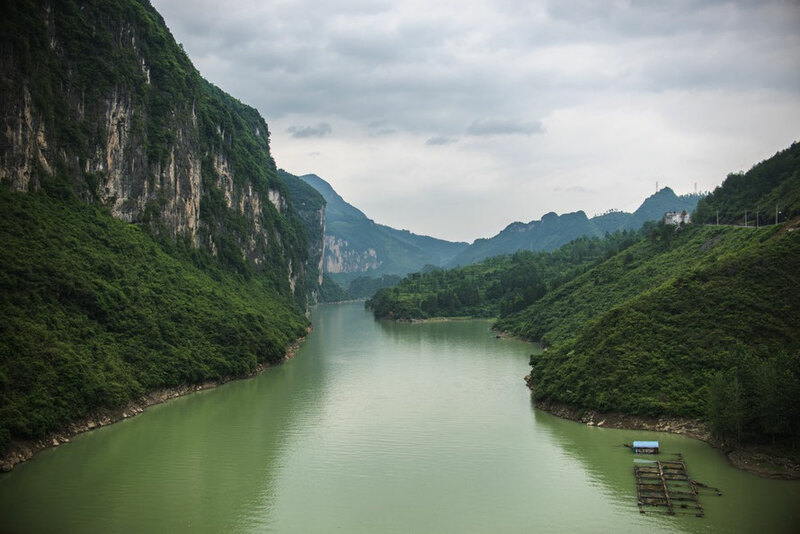 The deeper we get from the border the more the conical mountains of western Hunan seem to have been squashed and stretched, the earth torn high and filled with wide rivers of every shade from tan to teal to turquoise. At points even these colors themselves mix; seafoam tributaries from the mountains fall and curl into khaki torrents as they move unperturbed through years of bedrock overgrown with jungle trees that bend like a mass of monarch caterpillars. Houses, farms and factories all hug the river, some on corners of the bank only accessible by boat, dangling as close as they can to the edge, clinging to it like a child to it's mother. As we wind from one canyon to the next it seems increasingly unbelievable that the amalgamation of these deep valleys and high ravines is a municipality the size of Malaysia; a mass of people looking out from high rises hooking up from the hills who rely fully on the river –their lives pulsing with it’s ebb and flow. It’s a place very different from the China we’ve been in until now. As we curved into the valley onto the G209, halfway down western Hunan almost on the border of Guizhou, the sun was beginning to set and the mist was turning into rain. About 80 km ago we entered the Miao part of Hunan, an ethnic minority spread across southwestern China (and a broader term that includes other ethnic groups and Hmong peoples). Brick and concrete buildings huddled by the road were steadily replaced by wood houses built into the mountainside and black from years of layers of sap being painted onto their exterior; we pass by a local school where the concrete for a basketball court has been laid directly into a curve in the riverbed. As the rain gets heavy and pale blues began deepen with the setting of the sun, the sky overhead is suddenly cut in half by an incredible steel structure cresting across the gorge. This is the Aizhai bridge, almost 4000 ft long and 1000 ft off in the air, towering over a village lit by red neon hotel signs. 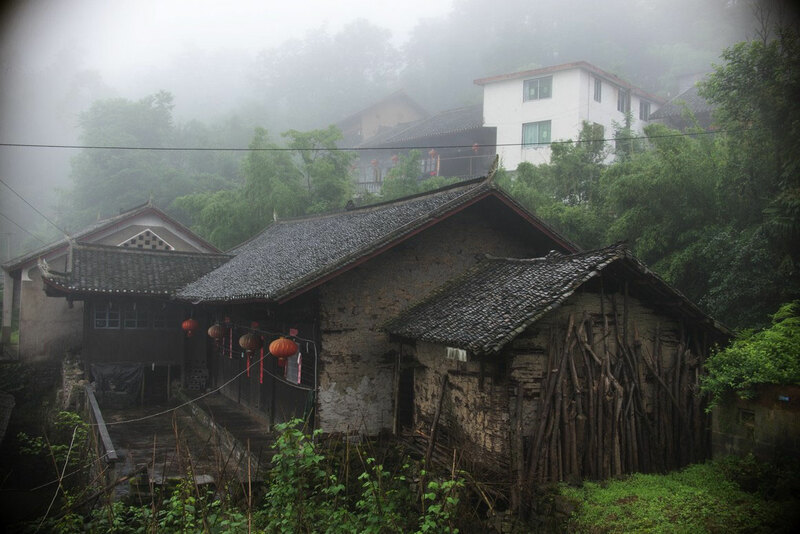 On Saturday we woke up in Cili (慈利) a town on the intersection of two rivers on the S306 in central northern Hunan, right at the eastern edge of where the province’s mountains really begin. We’d planned to leave early so that we could stop at Zhangjiajie, a famous “Scenic Area” (in some ways akin to an American National Park), before driving down father into western Hunan. Packing and departing was delayed slightly though due to the presence of our new biggest fans, two boys and a girl —ages six, seven and seven— who were extremely interested in what we were doing and why we were in their town. 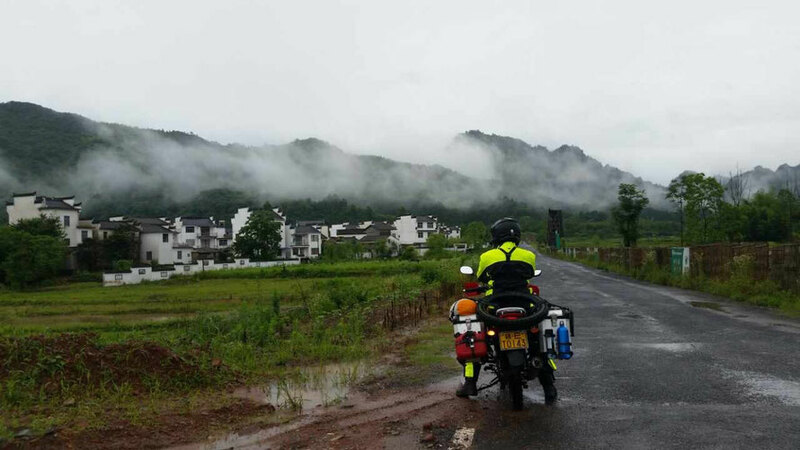 With skies (mostly) in our favor on day five, we headed out of Jiangxi, via another collection of less than sub-par roads, and made our way into Hunan with sights set on Changsha. A sweltering morning outside of Nanchang had us figuring out ways to cool off (Jieming opted for the cross-fan unzipped pant leg), but a soaked western Jiangxi had surprisingly a lot to offer including: a gravel quarry with great views and lot of broken machines that Jie decided to fix, willow tree lined roads, and folk tales about almost every slightly interesting natural formation, recounted to us by an extremely nice gas station attendant. Crossing into Hunan in the mountains, we floated down from the fog through a series of ten to twenty minute long tunnels, like riding the longest slide at a water park, and found ourselves shot out into Liuyang, the worlds largest producer of fireworks (60-70% global market share). 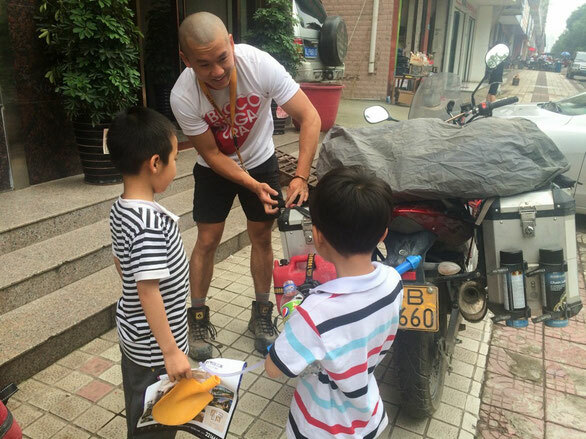 Not knowing how to mix motorcycles and fireworks just yet, we continued in to Changsha. Hoping to slip out before the rain started back up again, we left Jingdezhen today on our way to Hunan. After saying bye to some friends in the morning, we made our way mid-day through the seemingly ever-present mist that seems to have surrounded us the past few days. Jingdezhen city roads inundated with heavy rain tested our (and our bikes’) off road abilities – and ubiquitous murky puddles tested our faith in Jiangxi road construction. 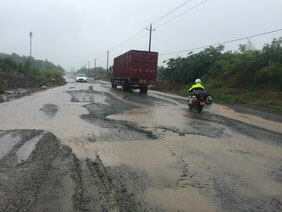 Faith in Jiangxi roads increasingly waned as we made it out of the Jingdezhen city center and were greeted by road after road of full lane construction –with no actual construction crews, or organization of any kind, in sight. On multiple occasions we thought that maybe these roads weren’t in use, but the swaths of semis and even police cars that crashed over rolling, soaked gravel potholes seemed to reassure us that we were headed the right way. Further down we ended up on a road full of multiple lines of rocks on one side, and a torn up lane on the other (we chose the former). 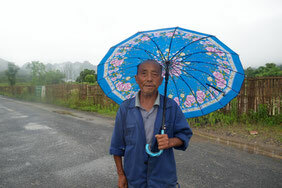 Rainstorms picked up again today as we headed from southern Anhui towards Jingdezhen, Jiangxi (Google maps link). But in between heavy showers the rain levelled a mist and low whisp of clouds across each village and miniature mountain range, turning an already beautiful scene into an awe-inspiring spectacle. Southern Anhui and parts of northern Jiangxi are home to China’s Hui style architecture: whitewashed houses topped with black, ridged roofs that are square but curl up to a point of the edges. Flanked next to full growth rice fields lush from all the rain, the area seemed to exemplify what many people imagine classical China to be. We stayed pretty much fully dry despite deep, deep puddles and roads that were halfway to rivers. Although the thrill of driving in the rain is quickly wearing off, in a sense we are lucky to encounter such heavy rains in the beginning of our trip, because we now know that we’ve done a good job of waterproofing all of our equipment. Heavy flooding in the area (link) made us think twice about our route, but despite minimal detours and multiple stops to double check everything we ended up in Jingdezhen early enough to meet with up Nate’s close friends.